This tofu-based cream cheese is a new favorite. It's like vegan Boursin! It's a really quick recipe too. Just wizz everything in a high speed blender or foodprocessor, dump it into a container and put it in the fridge overnight to firm up. No long fermentation or hard to find ingredients. I've already brought it to a few potlucks and family events and everybody likes it, vegans and omnis alike, so it's a real winner! The tofu and cashews make this cream cheese quite nutritious. It's higher in protein and lower in carbs than Tofutti. It also has less sodium and lots more useful nutrients like calcium and other minerals. It tastes good on (low carb) bread or crackers, but I also really like to use it in warm dishes like pastas, soups and casseroles. Cut the tofu into slices and press them between two clean towels with your hands to get rid of the nasty tasting tofu liquid. Drain the cashews and put them into the jar of your high speed blender, foodprocessor or immersion blender, together with the pressed tofu, garlic, salt, coconut oil, vinegar and water. Blend until it forms a completely smooth mixture. Depending on the power of your food processor, this may take a few minutes. If the mixture seems too dry, add a little extra water or coconut oil to make blending easier. Line a bowl with some plastic wrap and pour the cheese mixture into it. Smooth out the cheese and cover it with a lid or more foil. Put the cheese into the fridge to firm up for at least 8 hours (if you're in a hurry 3 hours in the freezer will also do the trick). Neatly covered, the cheese will keep in the fridge for at least two weeks, or you can freeze it for up to several months although it might get a bit crumbly in the freezer. 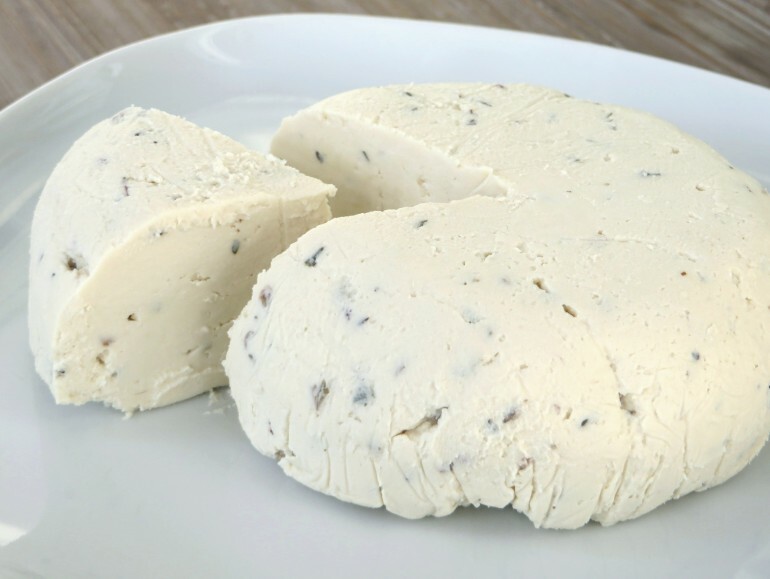 100 grams of this tofu cream cheese (that's a lot!) contains about 273 kcal, 24 g fat (3.4 g saturated), 4.1 g net carbs, 1,7 g fiber and 10.8 g protein. Made this yesterday😊 Delicious!! Although I used a bit more garlic and herbs but that's personal taste!! Great MJ, thanks for the feedback! Glad I said in the recipe to taste it and add more flavor if you like. Not sure what you mean by "neutral tasting coconut oil"? Hi Nicole, I mean a coconut oil that does nog taste like coconut. This is also called 'refined coconut oil'. Hope this helps! How would lemon juice be instead of white vinegar? Would apple cider vinegar be too strong? Hi Raewyn, lemon juice works very well instead of white vinegar. I personally also like the cheese with apple cider vinegar, but if you are sensitive to the taste, it could be too strong for you. I made this 2 days ago. It is fantastic. We've had it on toast and on crackers. Next we will slather it thickly on bread, add tomatoes and sprouts, and have great sandwiches. Thanks for another great "cheese" recipe. I think I now have a chance at being a vegan! Sounds wonderful Sheree! Glad you like it so much. I have to try this coming weekend. Sounds amazing! Hi Ursula, I hope you liked it! Hi Maya, you can use a little less coconut oil or replace some or all of it with vegetable oil. The cheese may come out less firm and more liquidy, but it will still taste good. What could I replace the coconut oil with. Allergic to coconuts. Hi Charlie, you can use any neutrally flavored saturated plant fat, such as palm oil, deodorized cocoa butter or even margarine or Crisco. Hi! I still don't understand what refined coconut oil means. Is Cocosa a refined coconut oil? Any brands you can mention? Great recipe! cant wait to try! One question, like your rice-flour cheese recipes - for this one; can I sub the cashews for riceflour instead? Or just something else to sub the cashews with (just not nuts) Thanks a lot! Hi Mathilda, you could leave the cashews out entirely and use a bit more tofu instead. Seeds like sunflower or hemp seeds might work too, but the result might be a bit more grainy, depending on the strength of your blender. Hello again. We got the neutral tasting coconut oil, and the texture improves as opposed to using vegan butter from the store. However, I find the vinegear taste really strong, is it supposed to be like that? Lemons was a little bit better. Do you think it's possible to use less vinegear/lemon juice and still get a nice result? Hi Trine, I find that some people are more sensitive to the taste of vinegar than others. If you do find the vinegar flavor too strong, just replace it with lemon juice. If you want a less sour cheese, you can also use less of all the sour ingredients. This does not affect the texture, only the flavor. If you have access to it, lactic acid is also a really good substitute for the vinegar/lemon juice. This is acid is commercially made from plants, but it the same type of acid as is found in dairy cheese. Hi Julie, the quantity of lactic acid depends on the form you buy it in. From what I have read, the powdered form can be substituted 1:1 with vinegar or lemon juice. The liquid form I have is much more concentrated, so I use it in a 1:4 ratio. Made today for a party tomorrow. It tastes phenomenal! I used silken extra firm, so not sure if will setup as well as using block tofu. If it's not setup in the morning I'm out to the market to make an additional batch. I've tried several and this is to me the tastiest! Thanks Margaret! I hope it set up well with the silken tofu. I think it should be okay, but I'm not 100% sure.